Well first my colleague Nicky showed me how to create an account on Blogger.com – which is a free blog space. It was easy, instantly satisfying and I was inspired to want to create a blog of my own. Though not immediately clear what that blog should be or do. and began to look at the recommended sites that Alan has included on his website. … in which secondary head of geography, Val Vannett, talks to her students through her Blog. I liked the personal and chatty style and the choice of activities/ places on the web that she suggests her pupils might undertake or visit. 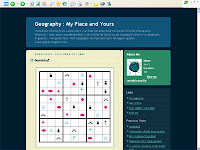 I thought that many primary teachers would get lots of ideas for creative approaches to geography from this blogsite and that it might provide inspiration for things to try in a primary classroom.